If we want resilient, sustainable communities, we need to reduce our focus on economic growth, materialism and consumption. While creating a less materialistic world will require major changes to our economic systems and there will be fierce opposition from many vested interested, there are also things we can do as individuals. Here are 10 ways we can reduce our consumption. Earn less – the more we earn the more we spend. As our income increases, so does our standard of living and consumption. Compare yourself to people worse off than you. We can always find people who earn more, have a nicer house, or go on more frequent holidays. But we can also always find people who are struggling to feed their families, who have never been on a plane, who can’t afford the necessities of life. We decide who we compare ourselves to. Shop less, and when you have to, try to shop second-hand. It’s simple: if we shop less, we are going to buy less. Talk about consumption with your kids. We can help our kids to be aware of the way advertisers and marketers try to make us consume more and more. Instead of falling for the tricks of the trade (e.g., buying branded products) we can talk to our kids about how companies are trying to get us to buy things that we don’t need. Our kids can be quite perceptive (for an example, see Alexa’s response to our discussion about Toy Story yoghurt). Find friends who help you reduce your consumption. If you have friends who are not caught up in consumerism, it’s much easier to reduce your consumption. Make sure you spend time with people who are into the simple things of life. Grow more and make more. Try growing at least some of your own food, and making things, rather than having to buy everything. Donate more. Donate your time and money to making the world a better place. Buy quality that lasts. When you do buy things, consider paying a bit more if it means that it will last longer and you won’t need to replace it as quickly. Get involved. Join with others in creating the changes we need to create a less materialist, consumption driven world. 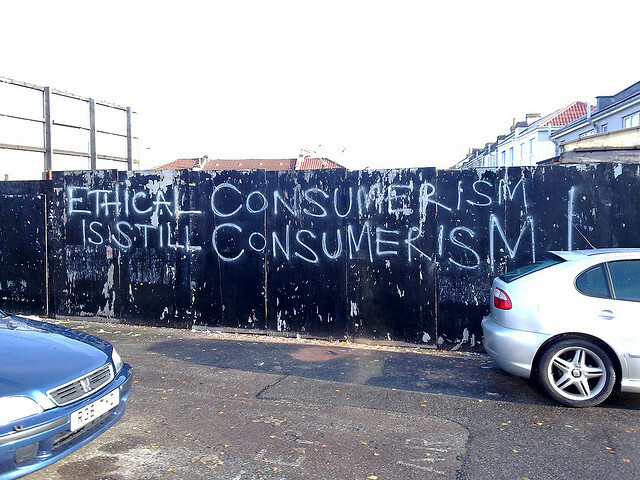 This entry was posted in Social change and tagged Consumption. Bookmark the permalink. It’s really helpful in order to keep our money safe from innecesary spending! Great Article. I share your thoughts. Last year I set out to make a difference by creating a site aimed at unnecessary consumerism. The site is called Snag (www.snagsomestuff.com) and allows people to borrow and share things. It’s free as long as you participate both ways. I would love to have your thoughts on it. My more comfortable lifestyle is someone else more suffering life. No. Virginia there is no Santa Claus. Do you believe in Santa Claus. Initiate new Christmas rules. Only parents or guardians give gifts to their own children and once they reach 18 years old or learn that Santa is not real then no more gifts for “Christmas”. The Business Owners built up the Santa Clause myth because it benefits them. Therefore the Customers have to dismantle it until Santa is completely dead for good because that benefits us. Awesome info. I want to learn how to consume less and reduce my carbon footprint. This info is very helpful for me. Good ideas. I personally found out that one reason for consumerism is boredom and not having interesting and meaningful activities. I had never experienced this problem before I came to Newcastle. Must admit I’ve never been bored in Newcastle! Thank you for this fantastic list. I’m sharing it with my kids. Yesterday I saw a bag that said “I like it, I want it, I’m buying it!”. Consumption is so much part of our culture. Love ads!! Maybe I need to turn off the ads, and buy quality – i.e., purchase an upgrade that is ad free! I have upgraded my site so there will be no more ads! Ironic automatic advertising placement: seen at the end of your article. “Work from Home & earn $13,475 a Month”. I like your list: practical and challenging.